So, you’ve determined the appropriate FDA classification for your medical device or diagnostic product, and now it’s time to select a premarket submission pathway. Pretty straightforward decision, right? If your technology is basically the same as (i.e., substantially equivalent to) a currently marketed device (predicate), then you file a 510(k). If not, or if your device falls into Class III, then the premarket approval (or PMA) is the route for you. Well... not necessarily. Sure, you can follow in the footsteps of the many device makers who have gone before you. Or better yet, you can evaluate all the potential options available and select the path that gives your product the best chance to succeed in an increasingly competitive and challenging market. In the sections that follow, we will explore the various FDA premarket submission pathways — including some little-known and little-used ones — and discuss how they should factor into your regulatory strategy. The two most common pathways to market for medical devices in the United States are the pre-market notification, better known as the 510(k), and the premarket approval, better known as the PMA. Within those two types of submissions, there are subtypes. For the 510(k), there are the traditional, special, and abbreviated forms, and for the PMA, there are the traditional, modular, and streamlined. In the 510(k) universe, my favorite type — when I can use it — is the abbreviated 510(k), because it is truly the easiest of the easy. Across the medical device world, the 510(k) is the simplest pathway to market, and within the 510(k) world, the abbreviated is the simplest option. On the PMA side, the modular approach is my favorite, especially when it comes to longer and more complicated kinds of submissions, dealing with more complex devices and technologies. But taking a step back and looking at the bigger picture, about 90 percent of medical devices (by volume) that are brought to market in the U.S. go through the 510(k). Most of these are traditional 510(k) submissions — about 70 percent of 510(k)s are traditional, 22 percent are special, and 3 percent are abbreviated. Only about 5 percent of devices brought to market are PMAs. For reference, it costs about $31 million to bring a medical device onto the market under the 510(k) pathway in 2014, compared to about $94 million for PMA. However, those numbers are only averages, and there is tremendous variability across the medical device universe. Most people think the PMA is reserved for the most risky (i.e., Class III) medical devices, and they consider it a path of last resort, since it is more burdensome than the 510(k). While that is sometimes true, it’s not enough to understand the rules — you must also understand the exceptions. Believe it or not, I have brought devices that were “510(k)-able” to market under the PMA instead. Why? For competitive as opposed to regulatory reasons, which I’ll explain further in a moment. The remaining 5 percent of devices are brought to market using one of five additional pathways: de novo, the humanitarian device exemption (HDE), the product development protocol (PDP), the custom device exemption (CDE), and the expanded access option (often referred to as the compassionate use or emergency use provision). It’s interesting — many people think it’s more complicated to bring a drug or a biologic to market in the U.S. than it is to bring a medical device to market. And in some ways, that’s true. However, there are really only two pathways to choose from in the drug and biologic world, but we have seven in the medical device world. Very briefly, I’ll describe the more common of those less-commonly used pathways to market and some of the advantages and disadvantages of each. Let’s start out with the de novo, which is the fastest-growing pathway for bringing devices onto the market. If you’re bringing a device to market for which there is no direct precedent, but that device is low-risk, the de novo gives you the opportunity to avoid the more rigorous PMA route. The example I like to use is a band-aid. Of course, band-aids are ubiquitous today, but imagine there were no band-aids. If you were bringing the very first band-aid onto the market today, the default classification for your band-aid, like any new medical device, would be Class III. It makes no sense to consider a band-aid as Class III, because you would be treating it like other Class III devices, such as the artificial heart, for no other reason than its new — that’s nuts! The de novo, a form of down-classification, offers manufacturers the ability to bring unique, low-risk devices to market in a much simpler way. The crux of the de novo — which is actually even simpler than the 510(k) — is the risk mitigation strategy. I won’t get into a lengthy discussion of the strategy here, but you can learn more about the de novo option in the two-part article I wrote for Med Device Online last year titled Secrets Of The De Novo Pathway. Not sure which regulatory pathway is correct for your device? For those of you who are familiar with the orphan drug program on the pharmaceutical side of the world, the HDE is very similar. This program seeks to encourage device companies to bring treatments onto the market for very small populations. The regulatory requirement is that humanitarian use devices (HUDs) treat or diagnose conditions that affect fewer than 4,000 people in the U.S. per year, but don’t let that number stop you from considering this option. There are many ways we can add up the numbers to stay under the patient limit. The HDE is one of my favorite ways to get medical devices on to the market, as I will demonstrate with an example shortly. The CDE, or custom device exemption, is the least-commonly used pathway to market today. Historically, it’s been used for dental appliances, prescription glasses, and prosthetic limbs. But looking to the future, the CDE has the potential to become as popular, if not more popular, than the 510(k). Now, most people, when they hear somebody say that, they think, “This guy must be nuts. How can the CDE go from one of the least common to one of the most common pathways?” The answer is simple. When it comes to personalized medicine — e.g., 3D printing of medical devices — the CDE, in my opinion, is the most appropriate pathway. It is by no means perfect, and I think we really need a new pathway to market for personalized devices. We are having discussions at FDA about creating one, but short of that, the CDE is probably the most appropriate path for personalized devices. A word of warning: Tread carefully when travelling down this path. Recently, an orthopedics manufacturer received a CDRH warning letter saying the company’s custom orthopedics would need a PMA or 510(k). So what happened? A few days later, the company announced it would permanently discontinue production of all custom devices, not just those listed in the warning letter. Now, what happens to the patients with no options — like in politics, power voids don’t last long, so can you say “off-label use”? What if something similar happened to 3D-printed devices? What would that do to this new and potentially very disruptive technology? Nonetheless, because the CDE is so rarely used, there is little written regulation on it and that, in and of itself, can be a huge advantage. Technically a subtype of the PMA, the PDP is ideal for devices where the technology is “well-established.” The PDP is essentially a contract (i.e., a meeting of the minds) that allows the sponsor to reach early agreement with the FDA concerning how to demonstrate the safety and effectiveness of the new device. The manufacturer can proceed at its own pace, and when the PDP has been declared completed by FDA, it’s considered to have an approved PMA. If you’re developing a Class III device using a technology that has been around for a while, this seldom-used pathway is worth a look. For everyone else, consider this: When thinking of the PDP as a contract, it is no different than any other pathway to market — an understanding between the manufacturer and the FDA as to what will be done from the beginning. This strategy, when implemented properly, will save a lot of time and headache in the end. The expanded access option, often referred to as the compassionate use or emergency use provision, is fairly self-explanatory. It allows an investigational device to be used, outside of a clinical trial, in situations where a seriously ill patient has few if any alternatives. Although there are often ethical considerations, it may be appropriate to evaluate this option as a way to get early feasibility data for high-risk devices, especially when suitable animal models are unavailable. Like the HDE, this data could then be used to expand the label in the future. Now that we have reviewed all of the available options, it’s time to discuss what I call competitive regulatory strategy. Which of the seven available pathways will not only enable you to get your product successfully on the market, but also make it more difficult for your competitors to follow in your footsteps? What are some of the factors you should you consider when selecting a regulatory path to market? Let’s look at a couple examples. You can spin the 510(k) any way you want, but at the end of the day, you have to show that your device is the same as something else. That, in my opinion, can be a significant limitation and certainly a challenge. One of the biggest advantages of the de novo is that you do not have to demonstrate substantial equivalence. You are starting out with a blank canvas in terms of the labeling, and you can paint onto it literally anything you can substantiate or prove. So here is my recommendation: Design your labeling (i.e., indications for use, etc.) not simply to demonstrate what your device can do, but also to raise the bar — that is, to make it harder for your competitors to follow you. That’s something to keep in mind when you consider the de novo. Another option is the HDE, which is one of my favorite pathways to market because it has no efficacy requirement. For most medical devices (as well as drugs and biologics), you have to show safety and efficacy, but there are exceptions to that rule. In the HDE world, you simply have to show what’s called probable benefit. I’m not going to get into the details of probable benefit, but suffice it to say that the absence of efficacy requirements can give you a significant advantage in getting your product onto the market. Another thing many people assume is that when you bring a medical device onto the market, you must choose only one pathway: the 510(k), PMA, de novo, HDE, etc. But nowhere in the regulation does it say that. Why assume that the regulation says something when, in fact, it does not? I have brought several devices to the market using multiple pathways. For example, in one particular indication, the device uses the 510(k), and for another indication of the same device, it’s the PMA. In that same example, the 510(k) was done first by choosing a part of the anatomy inherently less risky than the PMA indication. This allowed us to bring the device onto the market much more quickly and then do a label expansion via the PMA later. Of course, once a product gets on to the market, physicians can use it for whatever they want, which raises the question: Do we really need to do the PMA later? I’ll leave that as a rhetorical question, but this demonstrates the power of using regulatory logic rather than simply following the regulation, as most do. There are significant advantages to using this approach, and you can even mix pathways further. For example, I can bring a device onto the market under the HDE for that limited label, and then go on later to expand the label — something we do in the drug world all the time — to go after a bigger population via the PMA. Just last month, one very large medical device company got a PMA for a device that came to market five years earlier as an HDE. They used, in part, the post-market HDE data to support the PMA. This is the quintessential example of a label-expansion — something that does not happen in the device world very often, because 95% of the market is simply playing follow the leader. Bottom line: Not only are there advantages and disadvantages to each of these pathways individually, but you can also combine them, mix and match them, do very interesting things, all under the umbrella of competitive regulatory strategy. I’ll close by offering some advice on selecting the most advantageous regulatory pathway for your specific medical device. And that is, you really need to consider all of the different pathways that you have at your disposal — not just what has been done before, and not just from a regulatory perspective. If you’re working on a product, for example, where all of the devices before you have gone the 510(k) route, then it might be to your advantage to continue with another 510(k), but it might also be to your advantage to do something else. You don’t necessarily have to follow in the footsteps of those that have gone before you, because if you’re following in somebody else’s footsteps, you’ll never go anywhere new. You don’t have to do what has been done before. There are advantages and disadvantages to both. As a matter of fact, if it is to my advantage to follow in somebody else’s footsteps, then I will go into FDA and say, “I’m doing nothing more than what was done before me.” End of discussion. On the other hand, if it’s not possible or practical or to my advantage to follow in somebody else’s footsteps, I’ll try to carve out my own trail. Looking beyond the regulatory perspective is another thing you have to consider, because regulation does not exist in isolation. 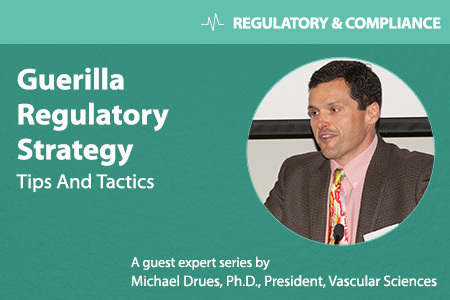 You need to incorporate your regulatory strategy with your reimbursement strategy, your product liability strategy, your intellectual property strategy, and so on and so on. For example, in a growing number of cases, I’m designing my reimbursement strategy first. Then I design my regulatory strategy to go along with reimbursement, not the other way around as many think. I learned that lesson when designing the regulatory strategy for a combination product. I made the case that the primary mode of action (PMOA) was a device, which was clearly desirable from a regulatory perspective. However, the manufacturer later asked to reverse it, arguing that the PMOA is a drug, because that provided higher reimbursement. Of course, we didn’t mention that part to the FDA (that shouldn’t be any of their business), and the product is now on the market. To conclude, unless you understand all of the different possible pathways to market that you can use as a manufacturer — not just the most common ones, but all of them, and the advantages and disadvantages to each and every one — then how can you effectively decide when to use (or alternatively, when not to use) them? There are a lot more possibilities out there than most people realize, and learning how best to use them is something I call creative regulatory strategy!